It has been a bit of a quiet week for Ballymore so far but we are looking forward to heading to Ararat on Thursday with three runners - Percivall Pott, Keen Desire and Nordic Duke. The first two will line up in the same race, the Homemade Cafe Beaufort Maiden Plate, a 2000m event in which unfortunately both Percivall Pott (12) and Keen Desire (15) have drawn awkwardly. Due to come in a few gates when the emergencies come out, the pair do look in a good race to show form with Percivall Pott having his first crack at the distance. "He should run very well," Michael Moroney said, noting that the son of Sir Percy is "stepping up to the trip that he is bred for." "He was luckless last start at Warrnambool," he continued - "he got held up for runs there but finished off nicely over the 1700m." To be ridden by Ryan Maloney, Percivall Pott strips hard fit at the fourth run of his debut campaign. Keen Desire meanwhile stepped up to the 2000m at Wangaratta late last month and was not disgraced when fifth on a soft track. "She gets her last opportunity to show us something," said Moroney, "but in saying that she has not had a lot go her way. She is a bit one paced so we will probably go forward on her this time." Lining up in the following event, the ClassicBet Handicap, also over 2000m, is Nordic Duke (pictured) who is nicely primed for a step up in distance fourth up having run very well during the recent Warrnambool carnival. "He strikes his right race," Moroney enthused. 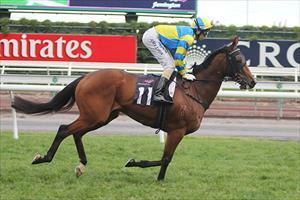 "He is going really well and his run in a stronger race at Warrnambool was excellent. He has taken a while to race into fitness this time in but he looks good now and Anthony Boyd's claim will help him."